Michael Potter is a Principal and Managing Director of RMA, responsible for the firm’s strategic direction and overall operation. As a member of executive management, Michael formulates and implements specific investment strategies on behalf of investors and directs the strategic growth of the firm. He also serves on RMA’s investment committee. Michael has over 25 years of experience in commercial real estate, with a background in real estate investment, fund formation and management, and law. Prior to forming RMA, Michael was a Managing Director of Metropolitan Real Estate Advisors. 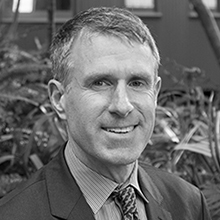 From 1990 to 2000, Michael was a Partner at the San Francisco law firm of Brobeck Phleger & Harrison LLP where he specialized in real estate investment, finance, development, acquisitions, dispositions and leasing. Michael earned a B.A. from the University of California, Berkeley. He holds a J.D. from the University of Southern California Law School, where he was an editor of the Southern California Law Review. Michael is a member of the California State Bar and a California real estate broker.